Starlet Santu Singh scored the only goal of the game for the Kerala outfit. 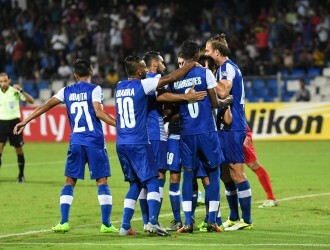 A Santu Singh free-kick handed Gokulam Kerala their second win of their first ever Hero I-League season against Chennai City at the Jawaharlal Nehru Stadium on Saturday. V Soundararajan replaced goalkeeper Uros Polijanec with Indian custodian Vigneshwaran Baskaran. Chennai's top scorer Jean-Micheal Joachim and Murilo Almeida combined upfront with support from an in-form Soosairaj who dropped deeper to dictate play from midfield. Bino George brought Kivi Zhimomi back into the starting lineup and chose to field Mahmood Al-Ajmi as the lone frontman. Mohamed Irshad and Ugandan Mudde Musa were paired up in the double pivot, with Emmanuel Chigozie and Daniel Addo being paired as centre-backs. The first half mostly dominated by the home side kicked off with a brilliant ball over the defence by skipper Soosairaj to find in-form forward Jean-Micheal Joachim whose audacious chip beat Bilal but landed on the roof of the net. The same combination troubled the Gokulam Kerala defence a few minutes later when Soosairaj's corner fell perfectly for the French striker inside the box. Joachim's shot, however, was blocked by a desperate defence. Joachim chipped in for Murilo later on with a perfectly weighted pass into the path of Murilo who rushed into the box and sent a low shot at Bilal. The goalkeeper went down in time to save the shot and keep his team in the game. Gokulam Kerala, who were slow to come out of their blocks, increased the pace of the game as the first-half wore on. Winger Salman was at the forefront of two golden chances for the visitors to break the deadlock at the stroke of half-time. The forward chested down a ball into the box for an onrushing Kivi Zhimomi who curled his effort wide of the post. A minute later, Salman was at the end of a through-ball into the box but flashed his effort wide from close-range. 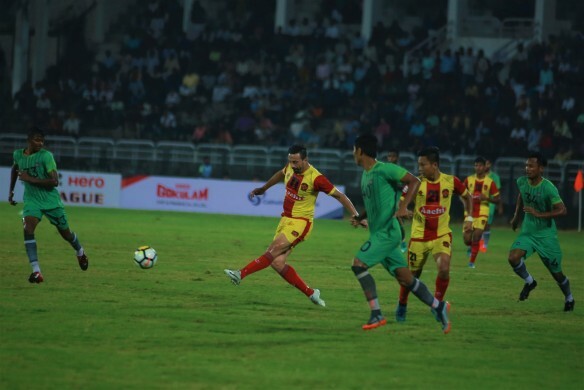 Soosairaj nutmegged his marker before getting into the box from the right and sending a delicious low across the face of goal but a lack of runs into the centre of the box by the Chennai City attackers denied the skipper a fabulous assist. The visitors shocked the home side at the hour-mark by scoring the opening goal. A free-kick delivered into the box by Santu Singh grazed the head of Kivi Zhimombi before hitting the net. A desperate V Soundararajan shuffled his team around in search of an equaliser but his star forward Murilo picked up an injury in the final stages of the match and had to be taken off.